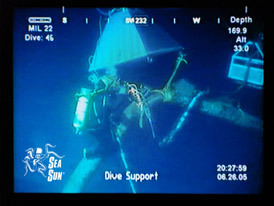 SeaSun® Lighting Systems are self-contained, high powered underwater work lights that provide stadium type illumination to assist saturation diving and ROV operations offshore. The umbrella and intensity of illumination provided by the lights allow divers, support crews, ROV operators and marine engineers to see a significantly greater area of the work site than possible before, significantly increasing safety and productivity. The SeaSun® lights have evolved from over 23 years of experience lighting underwater scenes on motion picture and television productions starting with the feature film The Abyss in 1988. In 1991, the Abyss lights received a Technical Achievement Award from The Academy of Motion Picture Arts and Sciences for “SAFETY and Portability” on motion picture sets and to date have worked on many film productions including: Armageddon, Titanic, Pearl Harbor, Navy Seals, Waterworld and Men of Honor. 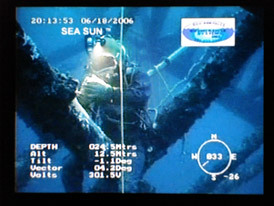 The first SeaSun® system to work in the GOM was deployed in May, 2005. 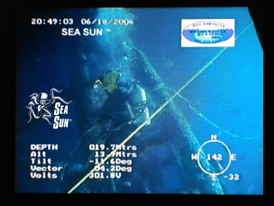 To date, SeaSun® lighting has logged more than 850,000 hours of underwater operation on numerous projects in the Gulf. Currently there are three versions of SeaSun® lighting packages available: The three light Shallow Water (100m), the Single Worklight (200m) and the ROV Deep Single (3000m & 6000m). The SeaSun® Shallow Water lighting system utilizes (3) 4000w arc lights mounted in a custom frame. The light output is approximately 48,000 watts of illumination. When placed 40′ to 100′ above the work site, the lights significantly increase the “Area of Visibility” adding to project safety and productivity. Variations in the distance from the light to the work site will vary according to the visibility and the size of the area to be lit. The SeaSun® Single Worklight, conforms to UL Standard 1573, CE Standards and to CAN/CSA Standard C22.2 NO.166. The Single Worklight allows the diver to position the light where it is most needed and it can be handheld or used as a drop light above the work site. The ROV Deep light is mounted in the ROV cage and separates the hi-powered light from the ROV’s cameras to simulate sunlight from above and significantly increases visibility for ROV pilots. SeaSun® lighting systems are available through Fast Forward Rentals, Lafayette, LA and Oceaneering Deepwater Technical Solutions, Houston, TX.